This is what we say . . . Imagine living in a restored centuries old mansion. The ceilings are lofted, the wood carvings are originals, and the ocean view is unobstructed. Art adorns every wall in the hostel. Couches are throughout, hammocks constantly swing, and the coffee is bottomless. The staff is the best of the best. 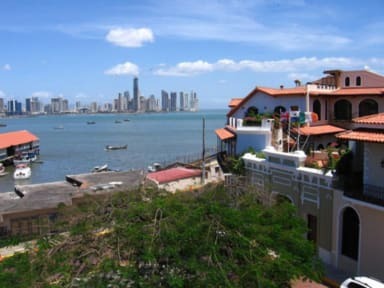 They will help you organize a trip to San Blas, sailboats to Colombia, bus rides to Bocas del Toro and, of course, recommend the finest that Panama City has to offer. If you are looking for a chill hostel, you have found it. If you are looking for an easy place to meet tons of other travelers, you have found it. And if you feel like closing out your evening with a cocktail, the bartenders in Relic (the bar in the outdoor courtyard), will mix it up for you. Check in from 09:00 to 23:00.